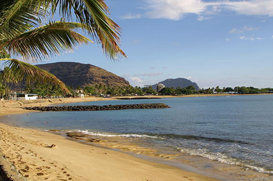 Popular beaches in Waianae are Wai‘anae Kai Military Reservation Beach and Nene‘u Beach. Due to the breakwaters constructed to protect the boat harbor at its northern end, the main sandy beach in Waianae is the only one on the Leeward Coast where swimming is safe year round. There are also many parks including the Pililaau Community Park, Waianae Regional Park, and Kaupuni Neighborhood Park. Waianae hosts the Waikiki Artfest as well as the Thomas Square Artfest every year. For shopping, the Waianae Mall Shopping Center is a popular tourist location.